The conduct of Higher Secondary Certificate (H.S.C) I (+1), II (+2) Science, Commerce, Arts Exams in the state of Tamilnadu is done by Directorate of Government Examinations (DGE) every year in three times – March/June/September. 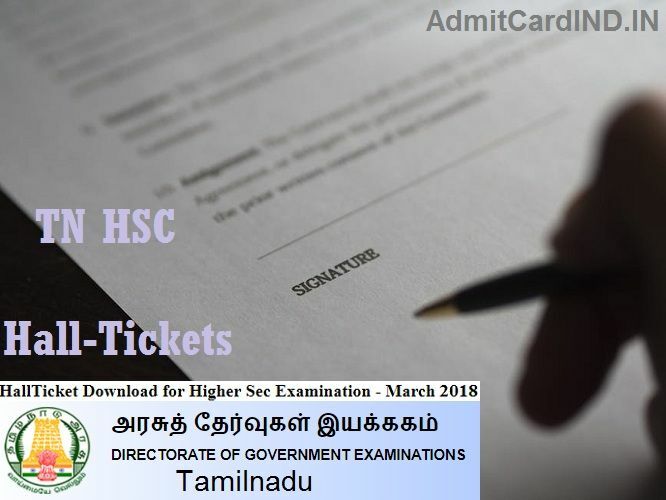 Regular students associated with schools won’t have to worry about the downloading of TN HSC Hall Ticket 2019 as their respective school will itself take this responsibility on behalf of them. Alongside, Registration numbers of candidates will be tagged inside the nominal roll and uploaded on the board’s website. And Every school must have to download the same before the beginning of Practical Examinations. Now, talking about the private candidates, they will have to take care of their admission certificate on their own from the directorate’s website. A piece of information regarding the distribution of hall tickets will be published in the News Papers/Channels too. For the attainment of hall ticket, it will be required from Pvt. candidates to enter their Application No and Date of Birth as login inputs. If any complication comes in the way of doing so, please feel free to write us in the comment box below. Aside from the March-April Board Exams, TNDGE is also responsible to take HSC’s in June/July and September/October. The agenda, routine and date sheet for this programme is also being notified by the board each year. Applications & Registrations for the special supplementary or instant or re-attempt (Sept | Oct) examinations shall be done in the exam centers/schools. A candidate must have to enter his/her current year’s Registration No for generating the Supply Hall Tickets. To bring more transparency in the evaluation, the board has also stated hosting of scan copy of answer scripts, re-totaling, re-evaluation kind of techniques. A student may opt any of these methods if they feel they should go for it. Regarding the procedure to apply for scan copy/re-totaling/re-evaluation, a candidate may get in touch with the school or can visit the official website. The annual examination for Public & Vocational 12th Std/Plus-Two (10+2) Class students is scheduled to be organized from March to April 2019. An admission certificate (hall-ticket) with the candidate’s photograph has been sent to the concerned schools for all the school candidates. Regular Private and Direct Candidates will have to grab the date sheet and March 2019 hall ticket of twelfth/XII/Inter Class from the T.N. DGE’s official site that has already been specified in the timetable above. All the questions papers will be set in English & Tamil Languages only except for the Chemistry, Biology, Physics, Zoology, Botany, Mathematics, Commerce, History, Economics and Accountancy. For the said exceptional subjects of Part III, permitted medium of question papers will be Tamil, Telugu, Malayalam, Kannada, Urdu & English. Apart from this, a scheme of examination, syllabus, textbooks to study will remain the same as per the recommendation of Tamil Nadu Board. Looking to know more about DGE Exams, Here is the next post about T.N. SSLC Permission Letter. I have missed my +2 application number. Don’t worry you can get it back. Are you a regular or private student? yes, absolutely. Thank you very much sir. MAR 2016 REG NO;587255 DOB 06.05.1999 I Have Missed my +2 Application Acknowledgment. Hi, Mr. Vignesh K. Thanks for writing us. In order to assist you better, here we would need to know in which exams are you going to appear general or vocational? And please mention your institute or school name? Can I know whether the hall tickets for the private student is released or not?? If yes can you send me the link of it??? Kindly send us your login inputs, Jrithika. Let us look into it. I am tn +1 student, if any mistake in the subject code, what I will do? Mr. Aron. In regards to this, you may check with your institutional authority. My exam no 1525613 my DOB 21/07/2001 I missed my application no. Can u plz suggest me ? I missed my hall ticket after the exam, I need it for the counseling process. How can i get the duplicate copy of the hall ticket? how much longer will it take? Hi Aakash. If it is concerning about your counseling then I recommend getting in touch with your school. I am sure they would have access to your registration details and ultimately they should be able to provide you a duplicate one. Please Let us know if still, you face any problem. Hi. If you need the hall ticket number kindly contact your school/issuing authority as the online link for 2018 plus two hall tickets might not work for you now. I have lost my hsc hall ticket. I am a regular school going, girl. Can I download it from my neighbor computer center personally? You’ve to enter the captcha code that is given in text form in order to submit your application number, date of birth. SIR MY APPLICATION NO; H191182400190 DATE OF BIRTH 06/02/1992 HSE SECOND YEAR PRIVATE CANDIDATES -EXAM MY HALL TICKET NOT DOWNLOAD? PLEASE REPLY ME. I AM SRIDHAR THIS IS MY APPLICATION NO:H191182400190. DATE OF BIRTH 06/02/1992 HSE-SECOND YEAR PRIVATE CANDIDATES MARCH 2019 EXAM MY HALL TICKET NOT DOWN LOAD SO PLS HELP US ASAP. Dear Sridhar, Your Hall Ticket is downloadable from here. Choose hall ticket link that shows HSE Hall Ticket for (OLD PATTERN 1200 MARK)” / OR If you want us to send you the hall ticket we can do that for you too. For that, we will need your email id. please provide us with that. Thanks for writing.